Fire at a Takhiantia car-coating factory injured one and caused about 10 million baht in damage. 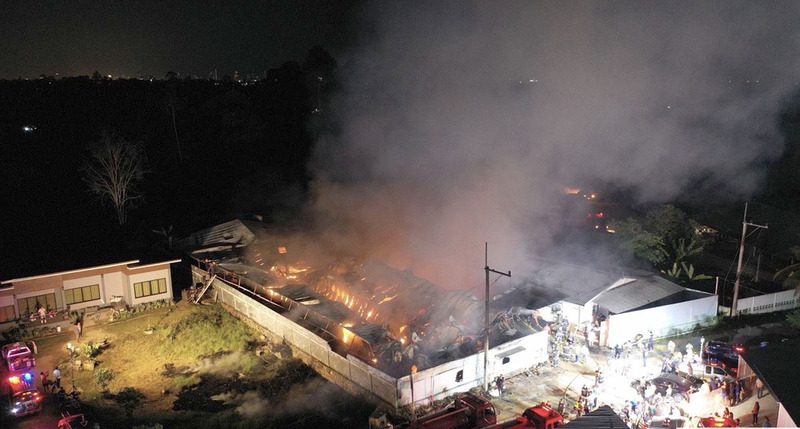 Fire at a Takhiantia car-coating factory caused about 10 million baht in damage. One woman suffered burns to her arm and leg in the Feb. 27 blaze at Pimpattaya Co. in Moo 1 village. She was treated at Bangkok Hospital Pattaya. The factory produced highly-flammable compounds including rubber cleaner, glass coating and other car-coating solutions. Firefighters battled the inferno for two hours without success until the roof collapsed. They then used a backhoe to knock down a side wall to gain access to the flames. Another two hours and the fire was out. Production manager Duangjai Jaipakdee said a spark from an electrical outlet ignited the fire. About 10 employees battled the fire with extinguishers, but the blaze spread too quickly.